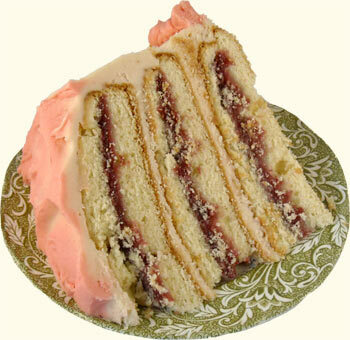 Discription:This is very tasty cake.Try it and Enjoy!! Grease and flour three 9-inch round cake pans generously. Mix cake flour, baking powder, salt and baking soda; set aside. Beat softened butter and sugar in large bowl with electric mixer on high speed until fluffy. Beat in flour mixture, milk, vanilla and eggs on medium speed until blended, scraping bowl occasionally. Bake 19 to 23 minutes or until toothpick inserted in center comes out clean. Cool 10 minutes; remove from pans to wire rack. Beat butter and vanilla in mixer bowl with electric mixer until light and fluffy. Gradually add powdered sugar and syrup; blend until well combined. Place 1/2 cup frosting aside for decorating cake. Level cake layers as necessary. Cut each cake horizontally to make two layers by marking the side of cake with toothpicks and cutting with a long, thin serrated knife. Place 1 layer cut side up on serving plate, spread with 1/3 of raspberry jam to within 1/4 inch of edge. Top with other half of layer, cut side down. Spread with raspberry cream frosting. Frost the sides and top of cake. Pipe remaining frosting to decorate the cake. 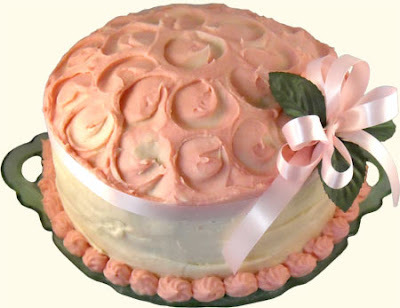 (I added a few drops of red food coloring for contrast against the pale pink cake). Refrigerate cake to set frosting. Allow cake to stand at room temperature 10 minutes before serving.